In my music education college classes, way back in the day, it never occurred to me to invest in children's books for my music classroom. I guess that it never occurred to my instructors either because I didn't hear about it until a few years into my teaching career. It sounds crazy doesn't it? There are so many amazing pieces of children's literature that lend themselves to teaching musical concepts and enhance lessons in history, movement, composition and more. This is a list of some of the books that I like using with Preschool through 2nd grades. This list is in no way complete, but hopefully it will provide you with inspiration when shopping for your classroom. If you are interested in my list of books for upper elementary, you'll want to check out THIS post with a long list of books that I keep for 3rd through 6th graders. Polar Bear, Polar Bear What Do You Hear? 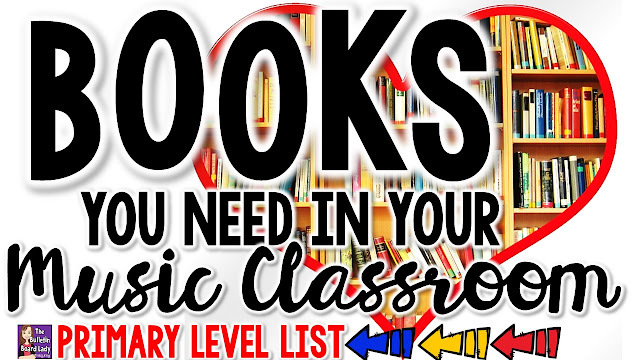 Bill Martin Jr.
Great for vocal exploration or incorporating classroom instruments, this list of books is just a few of the books that work well for adding instruments. Each book uses a repetitive and sometimes cumulative format that makes it easy for students to follow along. Looking for an easy way to get started with this kind of activity? Start with This is the House That Jack Built. At the beginning of the book, there is a cast list. Have your students brainstorm sounds they can make that would represent each character. Next, read the book adding those sound effects. So much fun! In my classroom, we don't really plunge into naming instruments and classifying instruments by family until 3rd grade. That being said, we learn about individual instruments and classroom instruments in K-2. 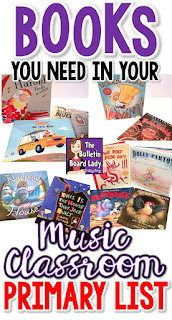 In addition to identifying instruments in pieces we listen to, exploring the music of Peter and the Wolf and Carnival of the animals, I like to use these books about instruments in class. Chicka Chicka Boom Boom Bill Martin Jr. There are thousands of rhyming books that have strong rhythm and repetition and work well for rhythm work. I've listed just a few and know that you probably have several books in your library that aren't on this list. With rhyming books, I often read them and have students keep the steady beat by patting or with non-pitched percussion instruments. You could have them isolate rhythms from the book and decipher their rhythm, play them on Orff instruments, create body percussion sections and more. Max Found Two Sticks by Brian Pinkney is great for rhythm work too, but isn't a strong rhyming book. I pass out drumsticks (or chop sticks!) and have students echo the drumming phrases in this book. This is a fun way to introduce this great book to a class. My Many Colored Days and What a Wonderful World are excellent books for adding movement with scarves and ribbons. Read the book, assign students a color or another key word in the story. When students hear that word or phrase, they move with their scarf. I use the Louis Armstrong version of "What a Wonderful World" to play while we move too. Giraffe's Can't Dance by Giles Andreae is such a delightful rhyming book! I love to cue up music to match the specific genres mentioned in the book and play it on our second reading. I challenge students to dance in the same style too. We're Going on a Bear Hunt by Michael J. Rosen is a great way to introduce the Bear Hunt activity most music teachers use in music class. I also like to keep this in my library so students can read and move during center time. This book is pictures only and makes the perfect introduction to opera! I explain to students that an opera is a play that is sung, not spoken. Then I sing questions and they sing their answers before we "read" this book. I sing what I think is happening on the first few pages and then invite students to take over the story in the same way. It is so fun to hear their creative improvisations! So fun for vocal warm ups, this book has students "mooing" in all sorts of ways! Looking for a great way to introduce dynamics to your primary learners? These books are perfect! Let me know what books you love to use with your primary students in the comments or on Facebook. If you liked this list PIN IT for later! 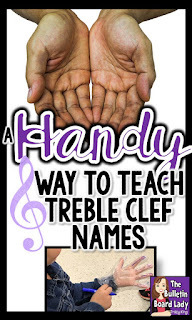 You've probably heard of using your hand as a visual aid for learning the names of pitches on the treble clef staff. With five fingers....err...four and your thumb to represent lines and 4 spaces, it is perfect! I wanted to take that idea just a little bit further with my students. This is what we did. Using plastic gloves and permanent markers we wrote the names of the lines at the tips of our fingers. To solidify the concept that our fingers represented the treble clef lines, we drew lines on our fingers too. Some of my students claimed they were drawing their bones! Next we found the spaces between our fingers and labeled them with the treble clef space names. With my students this year I used very thin, clear gloves that you might see food service workers use in your cafeteria. They were pretty inexpensive but were quite large for some of my smaller students. They were a safe choice for students with an allergy to latex. Another time I used latex gloves (pictured above). These gloves allowed us to write more clearly, but were MUCH more expensive. I bought a box of large and a box of small and they fit better than the plastic gloves. I would only recommend these if you were working with a pretty small class or were able to secure donations. Permanent markers dried pretty fast during this project. I experimented with several other writing utensils include ink pens, flair pens and paint pens. Permanent markers are definitely the way to go. After we finished our gloves we practiced using them with Music K-8's songs "Every Good Boy Does Fine" and "FACE" on YouTube. I also love Quaver Music's "Lines and Spaces" for this activity. The first time I experienced using flashlights to demonstrate musical form was in a workshop by the talented and genius, Artie Almeida. 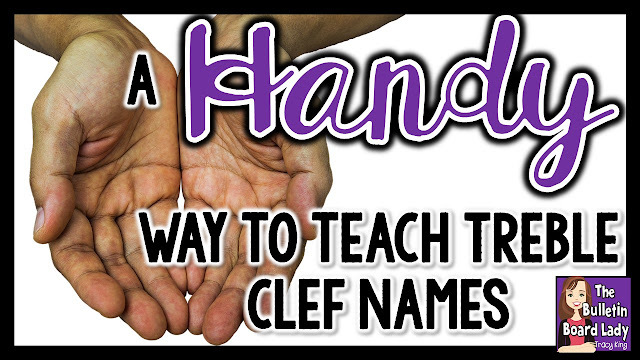 I love using them to keep students engaged and my students love them for their novelty. For most flashlight routines that I have used in class I use two or three colors. I use a large permanent marker and color in the lens. Depending on the marker, you may want to let it dry and then color it again. Instead of using permanent markers, you could use colored plastic wrap and rubber bands. I didn't like how often my rubber bands disappeared and turned into weapons, so after a time or two I decided this was not a good choice for me. I chose inexpensive flashlights from the dollar store about bought about 10 more than my largest class because I expected some of them to break easily. The batteries were pretty expensive, but with the help of a regional grant I was able to get enough to fill every flashlight. When using the flashlights sitting down, you get a large light on the ceiling. It's pretty, but not very distinct or clear if your room isn't completely dark. In the picture above you can see what it looks like when students are sitting. In the picture below students were standing. That produced a smaller, cleaner look to their light and it looked much better when we were all working together. You could always buy smaller flashlights with a stronger beam to get the same effect. Before putting flashlights in their hands we listen to the piece of music. We either follow a listening maps or we listen and create our own listening map. 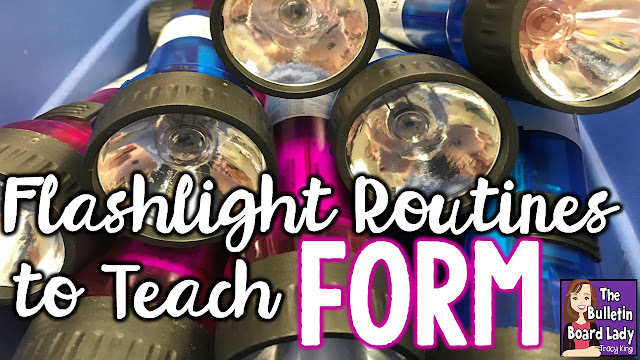 This gives students the experience they need to be successful when they get the flashlights. We label each section with a letter name and decide on an action for the flashlight. This video is of one of my 5th grade classes and their first attempt at a flashlight routine to "Cantina Band". This is an unedited, imperfect, completely authentic look at how this works in my classroom. I love how at section D they are in awe of their own awesomeness! 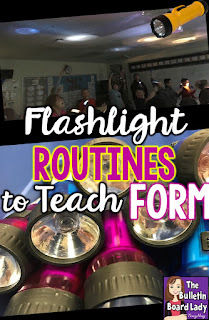 I hope this inspires you to try using flashlights in your classroom. Do you have any favorite pieces that would work well with flashlights? I would love to learn about them. Let me know in the comments. Some days when I’m greeted with an enthusiastic “Good morning! How are you?” I just want to growl and say “I’m tired.” I hate being that person, because would much rather be happy and cheerful. How about you? 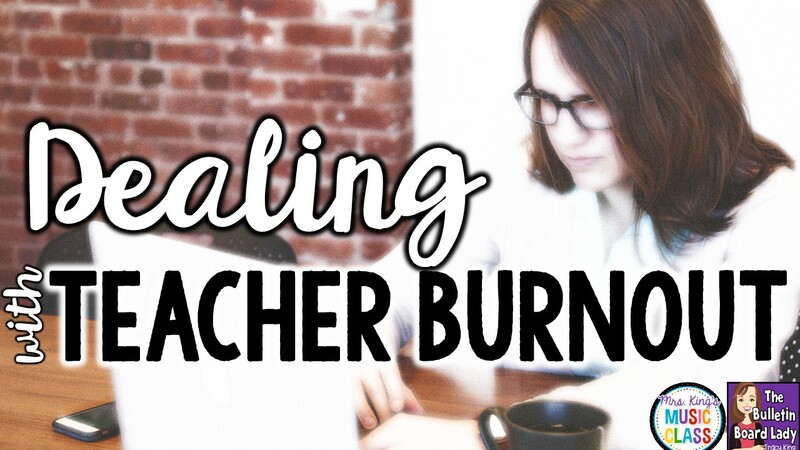 Let’s face it, teaching can be exhausting and burnout can happen to the best of us. How do you avoid burnout? How do you know if you’re there? What does burnout look like? Read on, my weary teacher friends. How do you know that you’re burning out? You are overwhelmed. You know there’s a lot to do and you are wondering how you will be able to add one more thing. Maybe you are thinking that you should compromise your values and expectations just so you can mark things off your to do list. You may even consider prioritizing but tell yourself it just won’t be enough. You are anxious. You’ve got that nagging feeling that you should be doing more. You may even realize that you actually need to do LESS, but still feel like you could do more and you should do more. You are tired. Maybe tired isn’t the best description. You are exhausted. Weary. You sleep, but don’t seem to rest. It’s the kind of tired that makes you want to crawl in bed at 6:30 and wake up in 3 days. 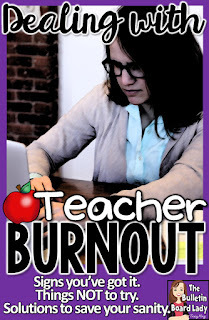 For me, I know I’m experiencing burnout when I sit down at lunch and daydream about going to bed that night. You just aren’t any fun. How long has it been since you laughed? Really laughed? Belly laughed? Maybe you just don’t laugh or smile as much as you used to. I hate unfunny me! It makes the days feel longer than usual. You just aren’t up to daily challenges like you used to be. You may not feel as creative, patient or enthusiastic as you once did. You may feel like you have just lost your edge. You just want to be left alone. Do you just want to find a big cozy blanket and hide under it? You may be experiencing burnout if you are craving a place to hide, a place where you aren’t tried and tested and no one will question you. A place that is just…quiet! 1. Look at that teacher or administrator that is really getting on your nerves. 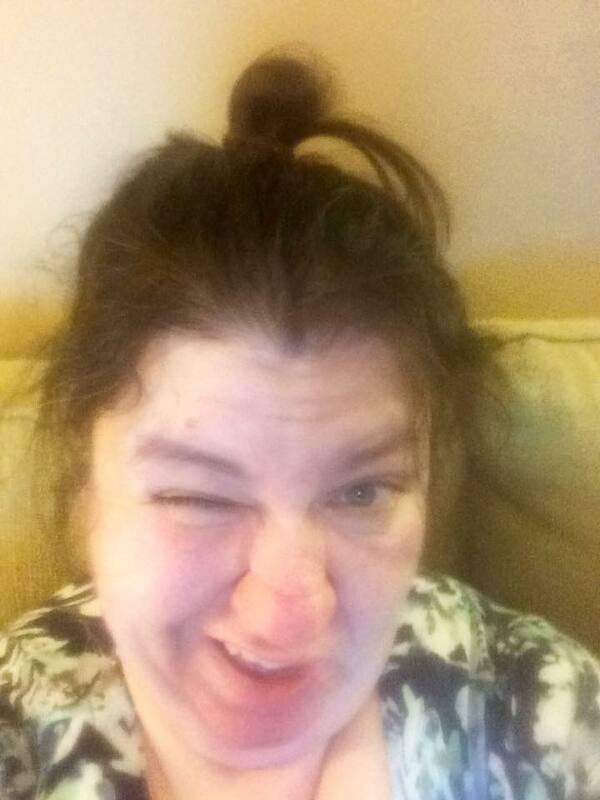 Close one eye and put your pointer finger and thumb in front of your other eye and pretend you are pinching their little heads. Incredibly satisfying. 2. Harry and David’s has these magic little bags of happiness called Moose Munch. Buy. Eat. Eat some more. Cry when it is gone. Buy more. Repeat. 3. Gallons of Diet Mt. Dew. I don’t really recommend any of these, but they are things that I have tried! 1. Get physical. I know, it’s not what I usually think of when I am tired and stressed, but exercising can give you quiet time, gets your endorphins popping and will make you rest better. You don’t have to go to the gym either. Take a walk, dance to a YouTube video with your kids, get a little romantic with your spouse, take a swim or even play a game of ping pong. 2. Be a list maker. Sometimes I get stressed because I am trying to remember everything that I need to do and inevitably forget something. Now, I make a list of things that I need to do and then stop worrying about it. My lists usually in three parts: Today, This Week and Sometime. The Today list includes things that need to be done before I go home. This week means as soon as I can and the Sometime list is for those great ideas that I want to do, but can’t do right now. Sometimes I copy things from list to list for weeks until I get to them. While that might sound crazy, if it is on the list I spend less time thinking about it. 3. Plan your quiet time. Schedule a time for a massage or a pedicure. Plan an afternoon where you have no responsibilities and turn your phone off. Schedule time to relax. Make it as much of a priority as you do your tasks at work. 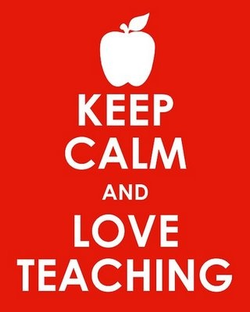 Your family and your students will thank you for it! 4. Get some rest. No, really. Go to bed a little earlier. End your evening with a hot shower, a favorite drink and perhaps meditation or prayer. Don’t research online, grade papers, catch up on emails or even make a grocery list. Just go to bed. 6. Be thankful. Sometimes when I am feeling overwhelmed and stressed it helps to count my blessings. Be thankful for your family, friends and co-workers. Be thankful for the things that are going right. Be thankful for the little things like outside recess and no bake cookies for lunch. Be thankful. You have the greatest job in the world! Save this article for later. PIN IT. 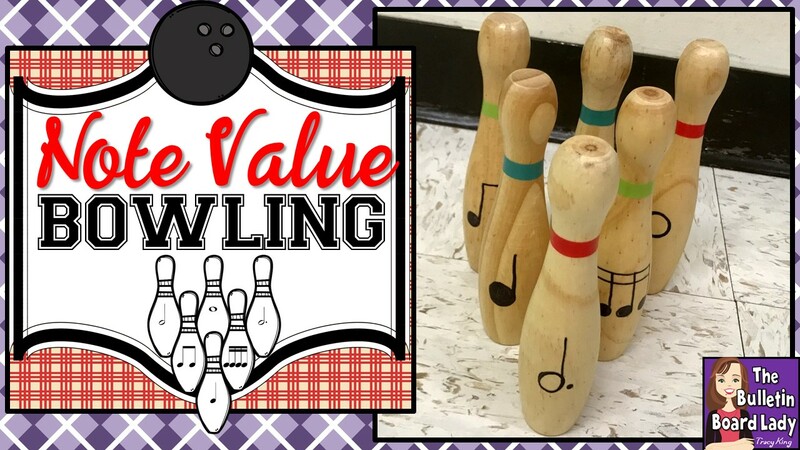 Bowling in music class? You bet! It may be your students' favorite music workstation! Read on to find out how to create the fun and functional workstation for your classroom. I have several sets of bowling pins at my house. I know that sounds weird, but I've been working on and then perfecting a bowling workstation for several years. The set that I used in the pictures is a wooden set. It is a nice size and weight and the pins make a lovely sound when they fall down. This set was on sale for 75% off when I picked it up. Music teacher WIN! I've picked up some at discount stores and yard sales too. From experience with Layton Music's Music Yahtzee, I knew that putting a single eighth not or a dotted quarter note would up the difficulty of this game to the point where not all of my students would be able to play and successfully record their score. I decided to use notes that would not utilize fractions, or their mathematical brothers, decimals. I used quarter note, barred eighth notes, 4 sixteenth notes, half note, dotted half note and whole note. I drew one of these on each of the six pins. I used a permanent marker, but you could also use a paint pen. I have a plastic set of pins. I used a white paint pen and a silver Sharpie to draw on the notes. They have held up quite well. Although you could store the pins in their original box or container, I haven't found a set that holds up well. I buy plastic storage containers and place everything in them. Before introducing the game to students I spent some time practicing. (Turns out I'm a pathetic bowler!) I experimented with how far apart to place the pins and how far back I needed to stand to roll the boll. If the pins are too far apart, they won't all fall down even with a perfect throw. If they are too close together, they will all fall down every time. I ended up finding the perfect distance for my set of pins and marking their placement with a piece of masking tape, I also drew the note on the masking tape to help them set up as quickly as possible. If you don't have a bowling set, you can create your own pins with 20 ounce soda or water bottles. You could even use empty 2-liter bottles. Spray paint them before drawing the notes on and add about a third of a bottle of beans or sand to steady them. Small Nerf balls would work great with these DIY pins. To complete the workstation, I include a score sheet on a clipboard and a pencil. 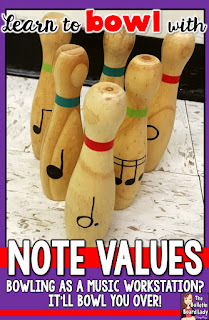 One version of the score sheet contains a "cheat sheet" and shows students the note value of each pin. The other version does not. My goal in using this workstation is to reinforce note values, so I don't mind if students use the score sheet with the references. They still gain practice in adding them all together. You can download both of the sheets by clicking on the picture above or by clicking HERE. I hope that your students enjoy this activity!